If you’re looking for a table that will make a statement, this is it. We were privileged to make this for local customers who are friends of our office manager. They came to us looking for a picnic table for under their covered porch. 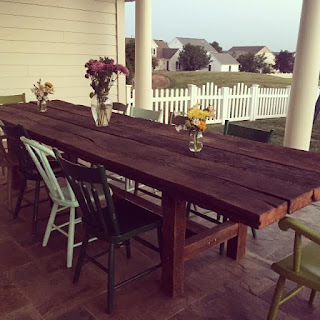 They saw these 3″, super rustic, Oak Barn Floor Planks and fell in love. To keep it as rustic as possible, as well as to keep a gap in between the boards for expanding and contracting, we left the original grooves (for a tongue to fit into) on all 3 planks and simply butted them up against each other. 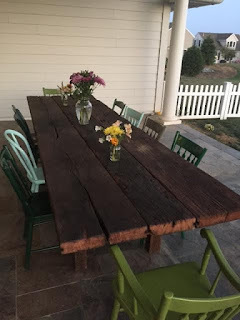 In keeping with the rustic look, the planks and base of the table were then finished with 3 coats of Boiled Linseed Oil. 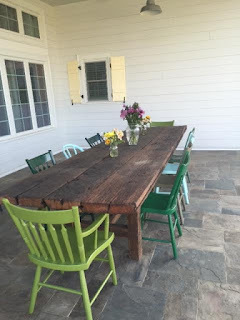 The customers added an awesome eclectic mix of reclaimed chairs. Doesn’t it look great?!? Posted in Uncategorized on September 10, 2015 by sharp_admin.